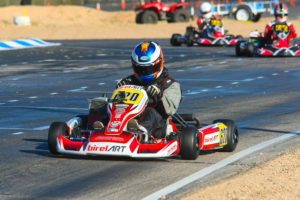 Back to back 2nd place finishes for FTK at Challenge of the Americas Tucson | Full Throttle Karting! Paul Bonilla topped the charts for the FTK Challenge of the Americas team. 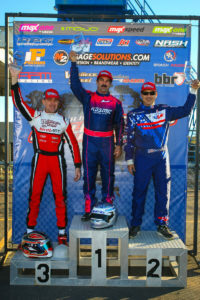 Paul Bonilla flew the FTK banner highest in Tucson, scoring podium finishes both days. Solid efforts by Ed Quinn and David Pergande saw them barely outpaced in the finals. There is no question that Billy Cleavelin is among the top Masters drivers in the country. The Cambrian Go-Karts Masters Max main event belonged to Cleavelin. Starting 11th after a mechanical issue put him on the sidelines in the Prefinal, the Rolison Performance Group / Kosmic pilot advanced his way forward quickly, reaching the second spot by lap five, and cutting into the lead of the top qualifier / Prefinal winner Paul Bonilla (FTK / Birel ART). Cleavelin posted fast laps, and was able to work past Bonilla quickly, driving away to a three-second advantage. Bonilla drove to second with Blake Choquer (PDB) placed third in his Challenge Masters debut. Chad Wallace (PDB) stood strong to hold on to the fourth spot while David Pergande (FTK / Tony Kart) ended up fifth. The weekend played out nearly perfect for Billy Cleavelin, sweeping the final day of action in the Cambrian Go-Karts Masters Max division. Cleavelin (RPG / Kosmic) edged out two-time series champion Paul Bonilla (FTK / Birel ART) in qualifying by 96 thousandths. Cleavelin got the jump on everyone in the Prefinal to pull away to a seven-second advantage with Bonilla fighting with David Pergande (FTK / Tony Kart) for much of the race. The 25-lap Final was all Cleavelin, leading wire-to-wire with consistent fast laps to end up over three seconds ahead of Bonilla. Pergande ran third until Chad Wallace (Birel ART) was able to work past late, securing the final step of the podium. Local driver Jim Keiger (Zanardi) crossed the line in the fifth spot, but was assessed a three position penalty for contact. That promoted Blake Choquer (PDB) into the fifth spot.